It may seem natural that Jamaica should have relatively lax rules on marijuana use, given the association among the country, Rastafarians and smoking ganja. Nevertheless, cannabis has been illegal on the island since 1913, when it was still a British colony, and under the Dangerous Drugs Act, possession, sale and cultivation of cannabis is illegal. That may change soon, with the government of prime minister Portia Simpson-Miller preparing to loosen Jamaica’s drug laws. Last week, the Jamaican government introduced a proposal that would, to a significant degree, decriminalize cannabis use on the island. Notably, the reforms would decriminalize possession of up to two ounces of cannabis (though users would still be subject to ticketing and a fine if caught) and use for all religious, medical and scientific purposes. 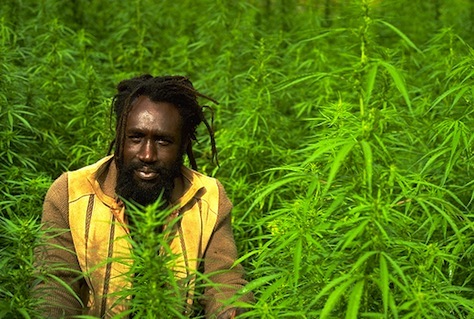 Though just between 1% and 10% of Jamaica’s 2.9 million people are Rastafarians, they believe the use of ganja in religious ceremonies is sacred. The Rastafari movement arose in the 1930s, and it worships the late emperor of Ethiopia, Haile Selassie, as a central sacred figure (before he became emperor, he was born Tafari Makonnen Woldemikael, hence the reference to Ras ‘prince’ Tafari). It was popularized in the late 20th century largely through the influence of reggae music, most particularly by Jamaican songwriter Bob Marley, an adherent of Rastafarianism. Simpson-Miller’s center-left People’s National Party (PNP) controls a two-thirds majority (42 out of 63 seats) in the Jamaican House of Representatives, and a nearly two-thirds majority (13 of 20 seats) in the Jamaican Senate, so the proposals are very likely to be enacted as law in a vote that the government hopes will take place in September. As in many Latin American countries, Jamaica has resisted liberalizing its drug laws out of fear of US retribution, including the withdrawal of aid and other support. A former Jamaican commission on ganja recommended decriminalization years ago, but no Jamaican government wanted to risk the wrath of the United States. Today, however, two US states — Washington and Colorado — have decriminalized the personal use of marijuana after ballot initiatives in November 2012 and the US justice department under president Barack Obama and US attorney general Eric Holder are largely allowing, and even encouraging, the state-level experimentation. Like many Caribbean countries since the 2008-09 financial crisis, Jamaica is suffering from lower tourist revenues and stagnant economic growth, as well as extremely high debt loads — in Jamaica’s case, public debt of nearly 140%. Jamaica also suffers fromextremely high crime level, with the sixth-highest homicide rate in the world, and the highest of any Caribbean island country, according to a new UN report. Despite a long history of fiscal difficulties, Jamaica accepted a bailout from the International Monetary Fund in April 2013, in partnership with the World Bank and the Inter-American Development Bank. Jamaica has been forced to implement tax increases and budget cuts in order to boost its primary budget surplus (i.e., before interest and debt repayments) to 7.5%. In 2013-14, Jamaica actually exceeded the IMF target with a primary surplus of $111.67 billion, and it’s hoping to achieve a primary surplus of $121 billion in 2014-15. That context makes cannabis legalization an important economic and security policy issue. Drug legalization would also almost certainly ameliorate violence related to the drug trade, and it will lighten the burden on Jamaica’s justice system, thereby allowing it to focus on more serious infractions. So long as Jamaica remains a signatory to the 1961 UN Single Convention on Narcotic Drugs and the 1988 UN Convention Against Illicit Traffic in Narcotic Drugs and Psychotropic Substances, there’s a limit on how far the government can liberalize its drug laws. But for now, the reforms could reduce the number of marijuana convictions, which can prevent Jamaicans from obtaining visas and otherwise hamper employment prospects. Jamaica’s action reflects a wider consensus in the United States and Latin America that drug law relaxation might be a better approach than efforts to criminalize drug use. Last year, Uruguay became the first Latin American country to legalize marijuana use, and other leaders have often mused about following suit. Otto Pérez Molina, the conservative president of Guatemala, shortly after taking office in January 2012, advocated drug legalization and critcized the hardline US position that’s opposed legalization in the past as well as the US-sponsored ‘War of Drugs’ as a failure. Former conservative Mexican president Vicente Fox has also called for legalizing marijuana, despite the brutal military efforts of his successor, Felipe Calderón, to fight Mexican drug cartels, and the opposition of the current Mexican president Enrique Peña Nieto. Photo credit to Matt Lennert / Flickr.